This will be another one of our "handmade/homemade" Christmas's, and I have a few ideas up my sleeve! I am taking this felted sweater and cutting out some mittens and possibly a hat from the hoodie part for our granddaughter, Trena. I even found a way to make the wool waterproof by using some lanolin, but not sure if she will need that. She's not quite 2, and for now, all she needs is something to keep her patties warm from the house to the car! 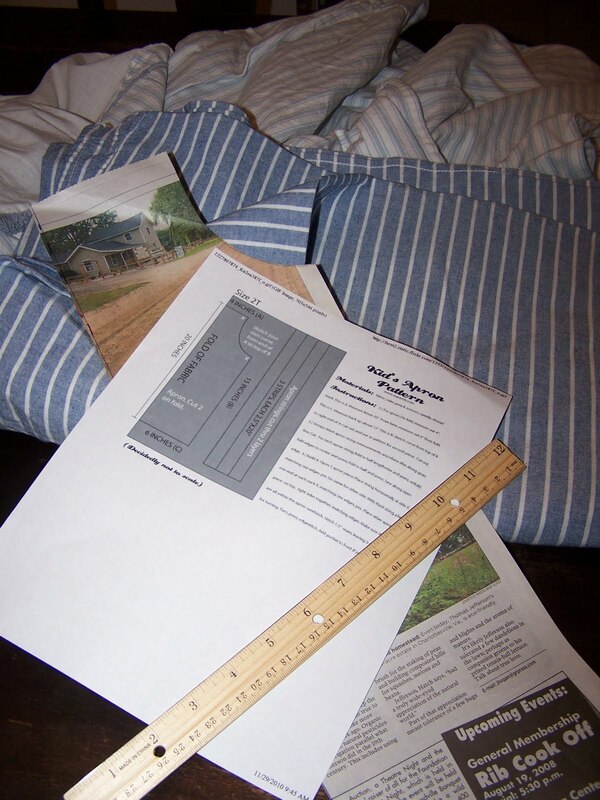 Free toddler apron pattern with beautiful Ralph Lauren sheets from Goodwill. I spend a few minutes googling free apron patterns and came up with what I pray will be the simplest one out there! Trena is just now getting to the age where she likes to be a mama's helper, and a sweet, full-coverage apron will help keep her clean and dry! I cut the pattern out of old newspaper and will begin the sewing later this afternoon. Anyone who was reading my blog back about 1 year ago, might remember the apron fiasco. of being outright liars when they state that a certain pattern is "Easy-Peasy". I need someone to S.P.E.L.L. it out for me, then actually S.H.O.W. me how to do it. I'll be back when I get the projects finished. If you don't hear from me till after the New Year, you'll know why. I DO have some wonderful handmade/homemade bar soaps available for purchase! Made in small batches right here in my farmhouse kitchen! Lavender, PURE (fragrance free), Citrus Cilantro, P.S. I Love You, Autumn Lodge (a nice manly fragrance), and Frosted Snowdrops. Each bar weighs approximately 4oz, and sells for $3.50 each plus s&h. Let me know quick, as supplies are limited! Wonderful! Those are going to be gorgeous! Yesterday I was faced with sewing another frock coat for Michael, for the annual Civil War ball. He's grown so much. No money for that. So I cut it right in half, and sewed a 6 inch panel of wool from a thrift store jacket, right up the center back, like a big fat pin stripe. No one will know the difference in the dark. Cyn, I couldn't agree with you more on the pattern companies! I've sewn for 25 years and still struggle with some patterns...Simplicity is one of the most difficult to understand most of the time, in my opinion. 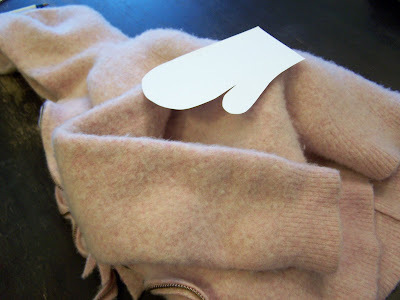 :) Can't wait to see your finished projects, the felted mittens sound wonderful! Very Nice! I really like your blog - keep up the great work!! I love the New Look of your blog..I feel so completely out of it..everyone seems to be doing blog make-overs..I guess that's what happens when you fall off the great Blog Ball.. I can't wait to see all the wonderful things that you make..
Did you get my email..? I pray you had a lovely ThanksGiving..
Glad to be back to visiting with you again..
Much Love to you and Big Hugs..
Cyn, are those Goodwill sheets for a double bed? Both sheets look just like the sets I gave to the Goodwill up here about 5-6 months ago: I have heard that GW does not sell items at the stores where they were donated. The darker blue sheets are Ralph Lauren; the others I am not sure about; the may have come from Kohls. I gave them away because I switched to a larger size mattress. ]The lighter set is a ivory with a dusty blue stripe. I hope they are mine! Wouldn't that be an amazing coincidence? Did you buy them at the same time? I am saving wool sweaters for the dame plan...it's just that you usually DO your projects. Yes, I remember the apron fiasco...don't give up! I was thinking about you yesterday and here I find a sweet comment from you today! Thank you so much for that wonderful quote you shared this morning. It is going in my journal! http://bakespace.com/recipes/Kibbeh-Burger I don't know if it is something you'd enjoy or not, but thought I'd tell you about it anyway. That dear precious little grand of yours is as cute as cute can be! I am so glad to hear someone besides me cannot follow patterns-I get the easy and still have to have my SIL help. I am just starting to sew again in my old age and wish I could do it better. Even a new machine doesn't help if I can't cut it out right!